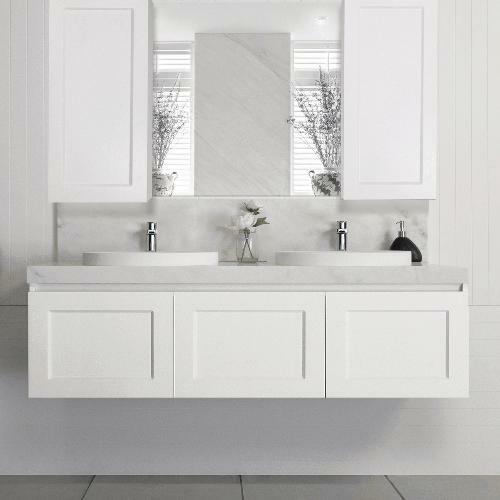 60mm benchtop available in Cherry Pie Premium Solid Surface, Friday Hybrid Quartz™, Bamboo (excludes under-counter basins) or Caesarstone® (additional 25% charges apply). See colour options. Matte White or Matte Black , Matte Milton Moon Grey polyurethane cabinet finish only. 250mm splashback, matching benchtop colour. ADP premium soft-close drawers in graphite with LED glass sides. Drawer models feature internal cosmetic drawer with leatherette organiser and integrated power point with USB ports.